The competition to hire veterans continues to be fierce. While many factors have brought us to this point, initiatives such as the Vietnam Era Veterans' Readjustment Assistance Act (VEVRAA) and private sector coalitions such as JPMorgan's 100,000 Jobs Mission have helped to ignite enthusiasm to hire service members. Today, the unemployment rate for veterans remains at near historic lows. Companies that embrace the veteran workforce are finding high-performing employees for a wide range of workplace scenarios, from manufacturing to software positions spanning entry level to management. Their advantage in the war for talent isn't a coincidence, though. These companies have well-defined strategies to recruit and retain veterans. The result is often poorly matched candidates and high turnover. According to Orion Talent's recent Veteran Hiring Survey: Exploring the Bottom-line Value of Hiring Veteran Talent, once companies are introduced to veterans, they are quick to engage. Not only do veterans bring many sought-after technical skills to the table, they're well-known for their ability to work independently, a strong work ethic, and leadership experience in situations far more challenging than most civilian experiences. The survey also points out that interview-to-hire ratios, job acceptance, and retention rates are higher among veterans, which are important considerations in a market struggling with the tightest labor market in years. A global software company providing digital solutions and hardware to its customers, Siemens USA employs over 50,000 people and has more than 60 manufacturing, digital, and R&D sites across the country. With approximately 1,500 highly technical positions open on any given day, finding quality candidates is among the most significant challenges the company is currently facing. Like other growing manufacturers, Siemens is tested daily by a labor market diminished by retiring workers as it competes for engineering, middle-skill, and digital talent. 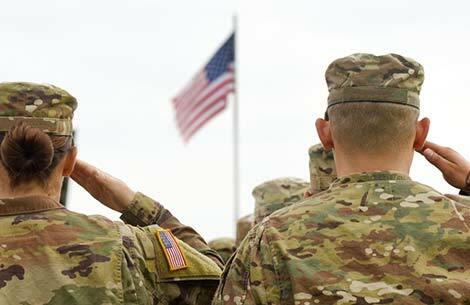 More targeted, proactive engagement of potential military candidates: Knowing that many of its roles can be done quite successfully by veterans with relevant experience, Siemens identifies ideal candidate profiles for key job categories and then focuses sourcing efforts on talent pools that can fulfill those requirements. Standardized onboarding: Creating common processes and standardized information for new employees can be challenging for companies with diverse operating units. To avoid missing opportunities to truly engage new veteran hires, Siemens utilizes an employee engagement program that is standardized across its eight divisions. This common framework includes a comprehensive approach to communication and an employee orientation website with onboarding information for HR, hiring managers, and new employees. Upskilling talent: Apprenticeships and classroom and online training programs are available in areas such as digital lifecycle management, computer-aided design (CAD), computer-aided manufacturing (CAM), and computer-aided engineering (CAE) software technology. Engagement from day one: Siemens focuses on engagement: individualized access to training, transparency into global job opportunities, ongoing performance management, and competitive compensation and benefits programs. Recognition within the military community: Central to Siemens' military hiring mission is a brand marketing campaign that positions the company as an employer of choice for veterans and transitioning military. Components of the campaign include a military careers microsite featuring profiles of veterans successfully employed at Siemens; job descriptions tailored toward veterans; content on benefits and resources relevant to veterans; a referral program that allows new veterans to easily refer their fellow service members; and the Siemens Veteran Network, an employee resource group with active chapters in Siemens locations across the U.S.
As enthusiastic as companies are about recruiting military talent, most recruiters do not have experience in hiring veterans. Here are some ideas to help make your team's approach to targeting and retaining veterans more effective. Lean on internal military employees: Consult with military employees and leverage their knowledge to map existing positions to military skill sets. Pair up new veteran hires with other former members of the military as coaches to help smooth assimilation into the company and accelerate productivity. Be proactive: In addition to traditional resources such as resume boards, veterans often have their own military alumni groups on Facebook or other platforms that are suitable for posting jobs. For prospective hires currently on active duty, consider contact points such as Military Transition Centers and on-base job fairs coordinated by transition assistance personnel. Provide structure and training: Veterans are drawn to structured development, training, and apprenticeships. Veterans thrive when challenged, so companies with defined career growth paths have an advantage when it comes to attracting and retaining veterans. Take advantage of online resources: There are plenty of resources to point talent acquisition teams in the right direction. For example, the Department of Labor has a comprehensive transition book. Publications such as US Veterans Magazine and Diversity in Action include profiles of successful veterans, their backgrounds, career search paths, and the types of roles they fill. Conducting a Military Crosswalk Search on O*Net Online gives a starting point for military occupations that are likely to match with specific positions. Create a military-friendly culture: Many veterans joined the service because they felt a calling to serve. While civilian companies may not be able to replicate that, they can certainly offer a purpose-driven company vision and culture to which veterans will want to commit. Most employees, both civilian and veteran, need a sense of pride in their company and to feel they are part of something larger than themselves. Since launching its military hiring program in 2010, Siemens has recruited more than 2,500 service members from all four branches of the U.S. Military: Air Force, Navy, Army, and Marine Corps. With over 60 percent working in STEM (science, technology, engineering, mathematics) disciplines, these veterans are providing technical field service support, running automation systems, and helping Siemens' customers deploy next-generation power systems. The drive, discipline, and talent of veterans are a winning solution for technology companies determined to stay ahead of the talent crunch and solve some of the most challenging needs of our country.